Marni Village is an all-inclusive luxurious village-style complex of traditional stone-built residences located amidst manicured lush gardens with trees, flowers and bushes. 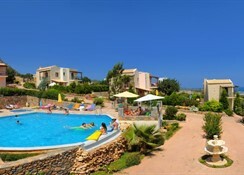 It is 100m from the Koutouloufari village in Hersonissos offering excellent views of the picturesque Hersonissos bay. 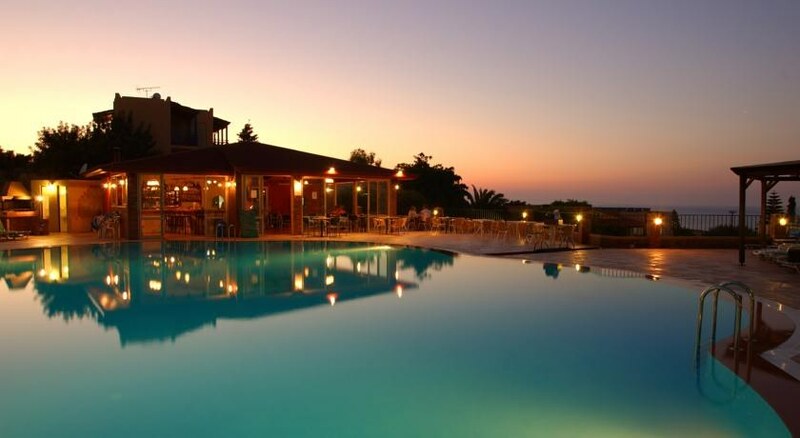 Offering 3 swimming pools, a floodlit tennis court and a sauna, the hotel invites guests to rest and relax amidst all modern amenities and warm hospitality enjoying the lovely sunshine of Crete. The well-appointed guestrooms have a furnished balcony or verandah which offer enjoys splendid panoramic view of the bay and come with a kitchenette, a seating area and a satellite TV. Some of the residences add a private pool. Marni Village is an all-inclusive luxurious village-style complex of traditional stone-built residences located amidst manicured lush gardens with trees, flowers and bushes. 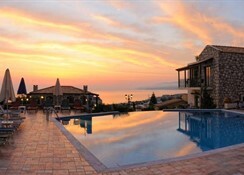 It is 100m from the Koutouloufari village in Hersonissos offering excellent views of the picturesque Hersonissos bay. Hersonissos with its variety of bars, restaurants and cafes is 1km away and so is its nice beach. 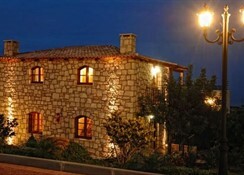 Nearby are the traditional villages of Piskopiano and Old Hersonissos. Marni Village has village-style complex of traditional stone-built residences that come in categories like Premium Studio, Superior Studio, Premium One-bedroom Apartment, Superior One-bedroom Apartment, Maisonette, House Maisonette and Two-bedroom Apartments. Recently refurbished, these air-conditioned guestrooms offer sea, pool or garden / mountain views and come with a furnished Kitchenette (fully equipped kitchen area, sink, 2 rings, mini-oven, storage cupboards, kitchen cloth), refrigerator, coffee/tea maker, kettle, safe, telephone and en-suite bath with shower and hairdryer. Guests at Marni Village can enjoy the a la carte breakfast which is served daily at the main pool bar’s area. 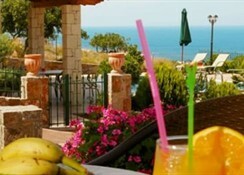 For Cretan and international dishes, local wine and refreshing cocktails there are two more bars. Special diet menus and packed lunches are available (on request). Shops, cafes and restaurants of Hersonissos are just a short walk away. Marni Village is set on 10,000 square metres of manicured gardens with trees, flowers and bushes. 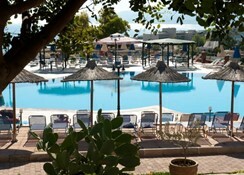 The pools are surrounded by spacious stone-paved sun terraces offering panoramic views over the bay. There are two separate pools for the children. There is a fully equipped gym for those who wish to stay active. There is a lovely spa with steam room offering massages and therapies. There’s a shared TV area and lounge where guests can watch sports events. There’s a business centre and banquet/meeting facilities are available. Public parking Public parking is possible on site (reservation is not possible) and charges may be applicable. is possible on site (reservation is not possible) and charges may be applicable.